PKSF launched Seasonal Loan (now known as Sufolon) programme in the year 2006. This groundbreaking programme of PKSF offers flexibilities and has become a prominent core programme of PKSF covering a major share of the yearly loan disbursement. Since its inception, this unique loan product has created tremendous impetus for the investment of different IGAs such as crop cultivation and processing, livestock, fisheries, agro-forestry agro-processing etc. The provision of the loan repayment in a single installment after the sale of the product has made it very popular among the borrowers, especially those engaged in beef fattening and crop cultivation. The extension of financial services to the poor community is increasingly becoming very important as a means of poverty reduction interventions. Some areas of the country have lack access to financial support. The Agricultural sector is one such area where financial service providers are not inclined to support. The high degree of risk involved in this sector is one of the main reasons for this aversion. PKSF started the Micro Finance for Marginal and Small Farmer Project (MFMSFP) in 2005. The success of this project led PKSF to design and introduce the Sufolon (Agriculture Sector Microcredit) Program in 2008. Sufolon offers comprehensive training program for the farmers and staff of the MFIs to develop their capacity in agricultural lending. To improve Sufolon program, attention is given to research, development of high-yielding seed, management of irrigation, mechanized and technology-based farming, and vocational education to produce skilled human resources and increased productivity. In FY 2016-17, loan disbursement of PKSF to its Partner Organizations (POs) under Sufolon is BDT 8.86 billion and outstanding amount of loan with POs under this program reached at BDT 5.50 billion. During the FY 2016-17 POs’ disbursement to its borrowers is BDT 40.84 billion and outstanding amount of loan as on 30th June 2017 is BDT 21.83 billion. 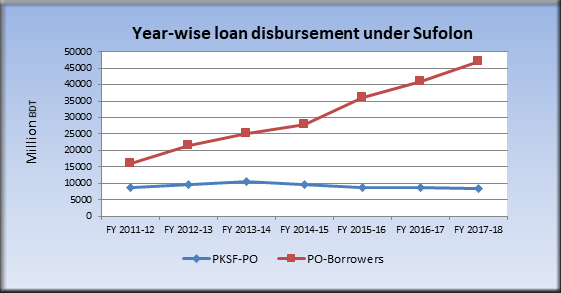 During the FY 2017-18, amount of loan disbursement from PKSF to POs is BDT 8.44 billion and outstanding amount of loan as on 30th June-2018 is 5.33 billion. During the FY 2017-18, POs’ loan disbursement to its borrowers is BDT 46.30 billion and outstanding amount of loan as on 30th June-2018 is BDT 22.58 billion. During the current FY (from July 2018 to August 2018) loan disbursement from PKSF to POs and POs to borrowers is BDT 1.16 and 6.30 billion respectively. Up to August 2018, total number of borrowers stood at 0.94 million. In August 2018, the average loan size under this programme is BDT 20,644. Up to August 2018, cumulative loan disbursement from PKSF to POs and POs to borrowers is BDT 80.78 and 243.92 billion respectively.